Petr Sgibnev was born on 25 August 1920. He spent his youth in Leningrad before joining the Red Army in 1937. In July 1940, he graduated from Eysk Naval Aviation School. In June 1941, Leitenant Sgibnev served in 12 OIA-KBF, flying Polikarpov I-153s. He was wounded twice during 1941 and the second injury was heavy requiring hospital treatment in Saransk. On 13 August 1941, he was decorated with the Order of the Red Banner. Between February and March 1942, he served in 72 SmAP-SF, which also was equipped with Polikarpov I-153s. This was a mainly fighter equipped composite regiment operating in the defence of Murmansk with the Air Force of the North Fleet. In March 1942, he was transferred to 78 IAP-SF, which was equipped with Hurricanes. On 4 April, the Hurricanes from 78 IAP-SF intercepted an attack on Murmansk and Starshii Leitenant Sgibnev claimed a Bf 109. German records states that Luftwaffe aircraft engaged those of the Northern Fleet Air Force’s 122 IAD, and admit the loss of Bf 109E WNr. 3523. Other pilots from 78 IAP-SF claimed Bf 110s when Starshii Leitenant Vasilii Shalaev and Starshii Leitenant Alexei Dizhevskii claimed one each. These claims aren’t confirmed with Luftwaffe records. The port of Murmansk was attacked twice on 15 April by Ju 87s of I./StG 5, escorted by Bf 110s of 10. (Z)/JG 5 and Bf 109E/Fs of II./JG 5. The 5712-ton British transport vessel Lancaster Castle was sunk by the Stukas during the attacks, the vessel suffering a direct hit to its engine room. A railway crane, a drydock and a warehouse were also destroyed in the port itself, while the canteen building caught fire and three railway tracks were severed. A 500-kg bomb fell into a bomb shelter, and although it failed to explode, the building collapsed, killing 21 and injuring eight. The second raid, at 18:30, met stiffer opposition, with ten Hurricanes and three MiG-3s of 2 GIAP-SF being scrambled to intercept the raiders. 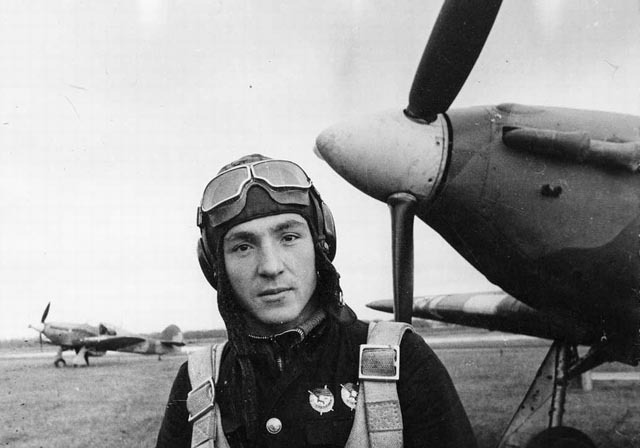 Leading the defenders was Kapitan Alexander Kovalenko, whose formation was accompanied by nine 78 IAP-SF Hurricanes led by Starshii Leitenant Sgibnev, as well as by a flight of I-153s from 27 IAP-SF. Six Hurricanes of 122nd IAD’s 769 IAP also joined in. Most of 78 IAP-SF’s Hurricanes, led by Starshii Leitenant Sgibnev, engaged the escorting fighters, thus giving the 2 GIAP-SF pilots their chance to attack the Stukas without interference. Sgibnev and his formation waded into the Bf 110s as they pulled out of their dives, the leading group firing three long bursts into the first twin-engined fighter in a head-on attack. According to Sgibnev’s report, the Bf 110 “dived steeply and crashed into the ground, leaving a trail of black smoke behind it”. Sgibnev then attacked a single Bf 109 from behind and slightly below from a range of 150-180 m. He again fired three long bursts, but could not prevent the enemy fighter from breaking off combat and diving away to the west. Sgibnev did not see the Messerschmitt crash so after the battle he claimed just the Bf 110 destroyed. Although his own aircraft had been damaged by bullets and shrapnel, it was soon repaired. Two of Sgibnev’s squadronmates, Starshii Leitenant I. L. Zhivotovskii and Leitenant Konstantin Babii, both claimed to have downed a Bf 110. Sgibnev was appointed CO of 1./78 IAP-SF on 1 June 1942. “We were patrolling over Mishukov Cape airfield when we encountered eight or nine Ju 87s at 1125 hrs at an altitude of 3500 m. They were flying out of the cloud and out of the sun on a bombing mission. I called on my group to close up and we attacked head-on and from below as a group. Having prevented the enemy aircraft from diving on their targets, they lost altitude and attempted to turn for home. This was a mistake, as their manoeuvring allowed us to get in behind them and continue the pursuit. In all, the pilots of 78 IAP-SF claimed to have destroyed ten enemy aircraft during the raid. This total was comprised of six Ju 87s, three Bf 109s and a single Bf 110. The following pilots from 78th IAP were amongst those who claimed to have destroyed a Ju 87: Starshii Leitenant Dizhevskii (who was promoted to Kapitan after this combat), Starshii Leitenant Sgibnev (1./78 IAP-SF), Leitenant E. M. Dilanian, Starshii Leitenant Petr Kolomiets, Leitenant N. I. Nikolaiev and Serzhant Alexei Pilipenko. Starshii Leitenant Vasilii Doroshin claimed a Bf 109. This earned him a second Order of the Red Banner. The Soviet fighters from 78 IAP-SF suffered no losses. It was not such a successful day for the pilots of 2 GIAP-SF, however. Seven Hurricanes, led by Aleksey Kovalenko, were sent aloft to counter the second raid on Murmansk’s port, but they suffered heavy losses. Three Hurricanes (BH328, Z5052 and Z5252) were shot down and Guards Serzhant A. V. Vanyukhin was killed. Only a solitary Bf 109 was claimed by Guards Leitenant Pavel Markov (Hurricane Z5252) in return, although this was not confirmed. 78 IAP-SF, led by Kapitan Sgibnev (1./78 IAP-SF), was in combat on 1 July 1942 when seven Hurricanes from the regiment repelled a raid by Ju 87s, the Soviet pilots claiming to have downed six of nine dive-bombers engaged without loss. The Germans, however, stated that only two aircraft were destroyed, Ju 87Rs WNr. 5691 and 6225. The aircrew involved, Leutnant Leo Schobert, Unteroffizier Arno Jansen, Feldwebel August Greiner and Unteroffizier Wolfgang Ossowski, were all killed. “Performing a barrel roll over the port, the pilots noticed a series of explosions from anti-aircraft artillery shells, indicating the direction from which the enemy aircraft were approaching. The leader of the group, Sgibnev, sighted nine Ju 87s approaching at an altitude of 3000 m. The leading group decided to attack the dive-bombers head-on. As a result of the first attack the dive-bombers dropped their bombs in the mountains. They turned and, descending one by one, set course for their own territory. Having dispersed their opponents, the Soviet pilots continued to attack the fleeing dive-bombers from close range. On 23 October 1942, he was decorated with the Gold Star of the Hero of Soviet Union and the Order of Lenin. Sgibnev was also decorated with the British DFC in the end of 1942. He left 78 IAP-SF in October 1942, when he was transferred back to his old unit (72 SmAP-SF) as a commander of an eskadrilia. This unit had become a guard’s unit, 2 GIAP-SF. Sgibnev became CO of 2 GIAP-SF in January 1943. Later, 2 GIAP-SF was re-equipped with Airacobras. On 2 April 1943, he was decorated with a third Order of the Red Banner. 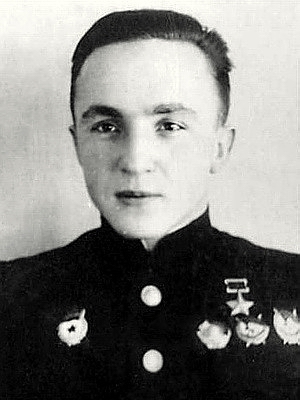 Kapitan Sgibnev was killed in a plane crash on 3 May 1943. At the time of his death, Sgibnev was credited with 1 biplane victory and a total of 17. During the war, he had been decorated with the Order of the Red Banner (twice). TOTAL: 17 and 4 shared destroyed. (a) Possibly Bf 109E WNr. 3523. (b) Claimed in combat with Bf 110s from 10. (Z)/JG 5. (c) Claimed in combat with Ju 87Rs from 3./StG 5, which lost 2 Ju 87Rs (WNrs. 5485 and 5545). 78 IAP-SF claimed 6 Ju 87 in this combat without losses. (d) 78 IAP-SF claimed 6 Ju 87s in this combat but only 2 seems to have been lost (both crews KiA). (e) Claimed as a “Storch”.